Dozens of people have visited the Elan Homes development in the first few days of the show home opening. The verdict from visitors is that they’re surprised by the spaciousness of the four-bedroom Southwold, which has four double bedrooms. Many are hoping to replicate the look created by Stanza Style in their own homes. 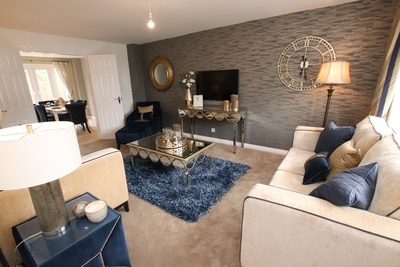 Marie Morris, sales director for Elan Homes in the North, said: “The overriding feedback we’ve had from those who’ve viewed the show home at Argoed Gardens so far is that they can’t believe how spacious it is. It is generously proportioned and designed very much with how people really live in mind, but is actually one of the smaller four-bedroom homes we are building. The combination of colour and texture in the show home, which features satin fabrics, embellished with sequins, creates a glamorous feel. For example, in the lounge, there is a neutral sandy coloured sofa with navy piping and offset this with gold mirrored furniture. Double doors lead from this relaxing space through to the open plan kitchen and dining room, which is furnished with a white dining table and blue velvet chairs. Upstairs, in the master bedroom there’s a brushed sequin throw on the bed that has a two-tone effect. At the end of the bed there’s a gold-framed stool, which complements the bedside tables. The second bedroom is styled as a guest bedroom, finished in white and blue to give a light and airy look with a fresh feel. There’s a sailing themed teenager’s room, complete with a sail on the wall, porthole effect mirror and shutter style headboard. The sea theme continues in one of the other bedrooms with wallpaper part way up the wall to give the impression of waves. Seven homes at the development have already been sold, with two others subject to ‘early bird’ reservations. Current availability includes a choice of three and four-bedroom homes with prices from £199,995. Many of the homes at Argoed Gardens feature south west facing gardens and enjoy interrupted views of the surrounding countryside. “Work at Argoed Gardens is progressing well and we’re looking forward to welcoming the first homeowners this autumn,” Marie added. Help to Buy Wales is available on properties priced up to £300,000 giving buyers the chance to defer paying up to 20% of the price by taking out an equity loan from the Government which is interest free for five years. Those using the scheme should only need a 5% deposit and 75% mortgage. The show home at Argoed Gardens, on Main Road, Mold, is now open. Find out more by visiting elan-homes.co.uk/developments/argoed-gardens.